My weekend adventure in the northwoods of Wisconsin began with a visit to Schlossmann auto dealership near Milwaukee, working with their top notch customer service team to find the perfect vehicle for my life - for the three day weekend, at least! I put on about 500 miles round trip; Eagle River is about as north as you can get in our beautiful state. You may have seen my post about Old Fashioneds in October hosted by the Eagle River COC. 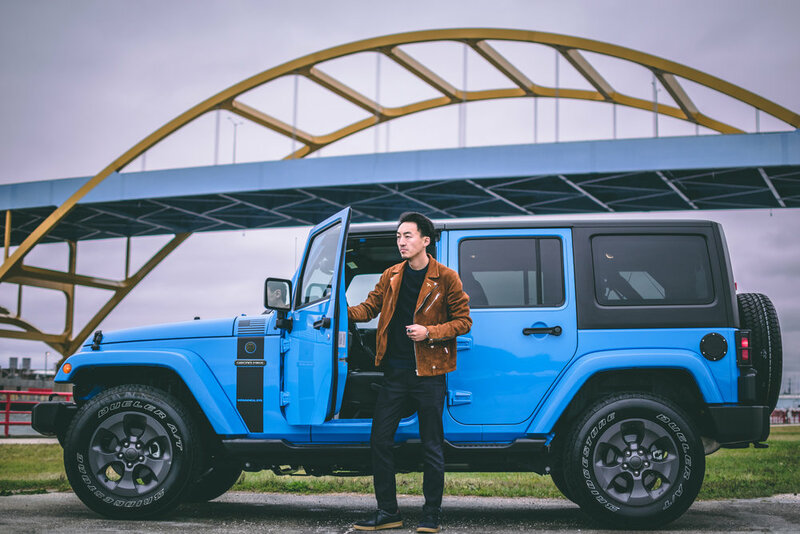 I made the trip in the Oscar Mike edition Jeep Wrangler that Schlossmann let me test drive for the weekend, and it was truly a dream ride. As a kid, I didn’t dream of Ferraris and BMWs – a Jeep Wrangler made the top of my “someday” list. My favorite part of working with the Schlossmann team was the clear emphasis they put on service and making potential customers feel welcome and valued. The minute I walked in, I was greeted by people who obviously wanted me to feel comfortable. I sat down with an expert to talk through my goals, plans, and lifestyle to match me with a vehicle that would make the most sense for me. I really appreciated the personal attention and learned from them that it’s an integral part of their customer interactions at Schlossmann, and something that they pride themselves on. When I’m looking at a new vehicle, I’m not only concerned about the new vehicle’s stats and performance. I also look at the service offered by the dealership I’m working with. My current car is getting to the age where it needs maintenance on a fairly regular basis, just for small things, so service is on my mind a lot. I like knowing that the service offered by Schlossmann for the Jeep (or any other vehicle I might want to bring to them) is high quality, personal, and performed by qualified technicians I can trust. It was important to me to know this before driving off the lot, and Schlossmann’s reputation is solid when it comes to vehicle service for any of the brands they supply (including Jeep, Subaru, Honda, Dodge, Chrysler, and Ram). Not only that, but they offer convenient service (on Saturdays! ), free wifi while waiting (definitely important for my work), and even shuttle service if you need to get somewhere while the vehicle is being serviced. Win, win, and win. Now for the most important part: the Jeep itself. I could rave about this all day. It. Was. So. Fantastic. Let’s start with the most obviously “Wrangler” thing about the Jeep: the hard top. It was surprisingly easy to disassemble the top, and you really only needed one person to do so. Unlike the older model Wranglers, this one’s top came off in pieces and re-assembled quickly. Unfortunately, the weekend I had the Jeep was fairly rainy and cold, so I only took it for a quick spin without its top. My next favorite part was the sound system inside. Even though the Wrangler was fairly stripped down compared to an SUV or other car, the interior sound system was pretty awesome. You guys know how I love my music: lots of bass, lots of quick lyrics, so sound quality is especially important to me. The ride in this Jeep was also fairly comfortable. Given the stripped down nature of the Wranglers, particularly older models, I was anticipating a rougher ride overall. However, I was pleasantly surprised; it didn’t ride like my CR-V, but it was a better ride than my ten-year-old Honda Civic. I drove it about eleven hours round trip from Milwaukee to Eagle River, and neither my wife nor I had any complaints about the ride. Overall, my experience in both the Jeep and with Schlossmann’s team were five stars in my book. Thanks for the excellent weekend adventure, guys, and thanks for convincing me further that I was right to list Jeep Wrangler as my dream car!